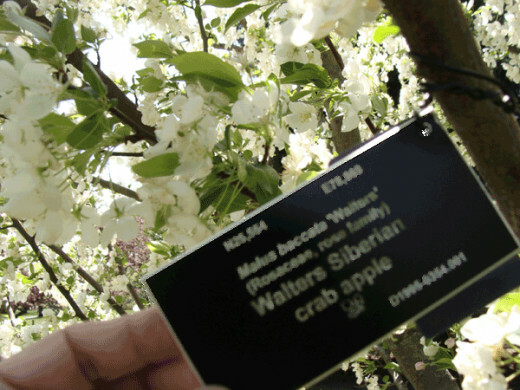 What if you could see which shrubs and trees grow well in your landscape? Or learn of plants mature sizes without waiting for years? An Arboretum can show and tell. An Arboretum is a place where trees are grown, but not only trees. Many are places to find shrubs, perennials, and wildflowers – many plants that you may wish to have in your garden. It is mostly a showcase for woody plants, however. Purposes for Arboretums are not simply as places where there is a collection of interesting and beautiful plants are grown, although they are that;. The purpose for these landscapes is to gain scientific strides in horticulture, with education of the public in mind. Arboretums are grown with an educational mission. To help visitors become familiar with the kinds of plantings that are grown within the collection, to learn how to combine plantings, to aid with conservation. One expert calls such a place a “Museum of trees”. How will that well praised tree of the garden center look after twenty years? Will it need to be moved or cut down? How about the shrubs you planned to put at the front of the house? Will your planting spaces prove too crowded in just a couple years? Arboretums provide a visual answer. These are also places that explain the uses of plantings, important growing information is offered, even discovered. They are a place where endangered botanicals can be protected, propagated. Where one can learn of the possibilities of a landscape. How Does Plant Knowledge Save Money? On of the best investments in improving your home is spent on the outside, creating an attractive yard. Many people either neglect that fact, or hire someone to do all the planning and work for them -or they move into a home where the choices have been made. But learning a bit about the plants that will work best to form a useful and pleasing garden area will enable you to work with a professional more efficiently, or maintain valuable landscaping. 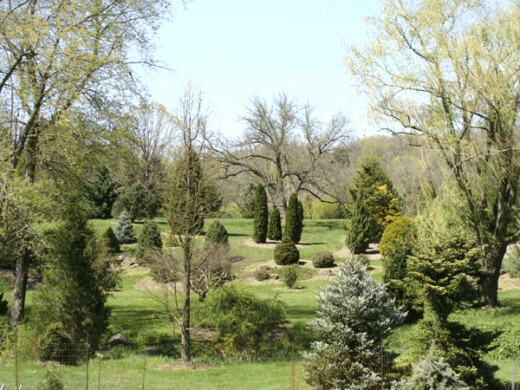 An Arboretum is the place to go to find new, improved landscape selections, or how to care for older ones. One you have your yard’s plan in hand, a visit gives a first hand look at the actual plants ( quite different from a simple description or blobs on graph paper). There are ideas for gardens and an array of many different cultivars, all arranged so they may be seen growing in a real garden where their attributes are best displayed. 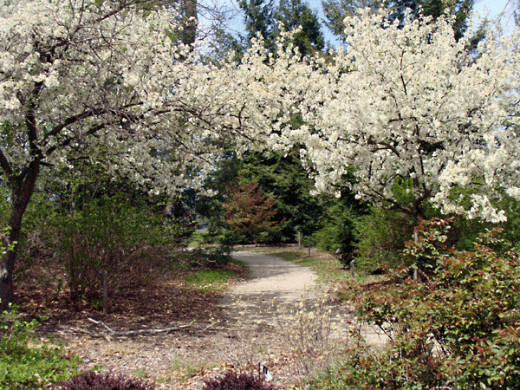 A crabapple walk at Dawes Arboretum was one of those. Many people think of planting crabapple trees, especially when they see the gorgeous spring bloom. But how do you pick the one for you, of the hundreds of choices? How do you know that you would like one beside your own driveway? Seeing which have tiny fruits (that are almost no nuisance at all), and which ones have fat squishy fruits that are great for jellies, (but not so wonderful when dropped on the walk to the house) can make the choice for you. Such illustrations save costly mistakes, and help with the best landscape choices for shading, protecting, and complementing a home. Know How, Isn’t That What I Pay A Professional For? WHY DO I NEED TO KNOW ABOUT MY LANDSCAPING? You do pay an expert for their knowledge and help. The best professionals will consult with the client’s opinions, goals, and desires, however. Even if leaving the yard to others, the initial choices and continued oversight will benefit from knowing the facts. You help them to help you, in other words. Besides, a place where the facts of plants are pleasantly presented in glades, dells, and flower gardens is probably the most enjoyable way you will ever experience in getting an horticulture education! Explore, take a walking or driving tour and get around the place to see what is growing there. Take advantage of educational opportunities, there are often special events, lectures, plant sales. Take notes. If you see a shrub or tree you like, write down the name, they are labeled. Find out how trees and shrubs can save energy by cooling or protecting the home, buffering winds, or provide privacy. 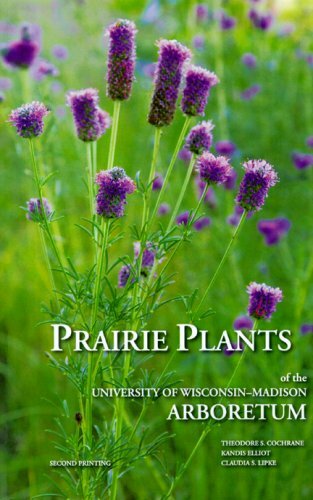 Get information and ideas about how the plants are used in the landscape. One thing I have learned about growing things is the huge difference between reading and hearing about plants and gardens and the actual experience of them. This is what an Arboretum provides: an up close, in person learning experience with growing trees and other woody plants in a way that incorporates the health of the plant and environment and creating a beautiful place. All the plantings are labeled. Take notes with your phone! 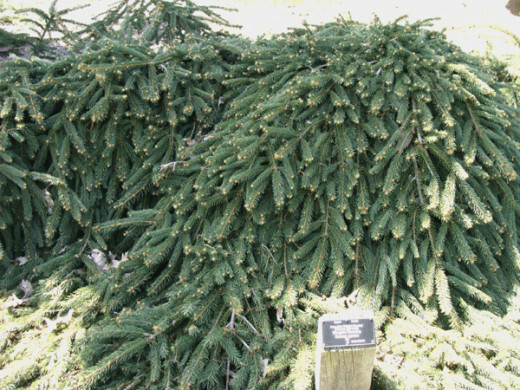 How many spruces are there? The Evergreen Glen was highly educational, and it was a pleasant afternoon walk. Dawes is a place I visit regularly. The pictures in this article come from those visits at different times of year, although spring and fall are my favorites. My soil conditions may be different, but just as I found invaluable information that led me to plant shrubs and trees which were later found on sale in the nurseries, you can too. I had seen the specimens growing at the Arboretum, and knew them to survive our winters. I could see the space they occupied before putting the shrubs into places that would require constant pruning. And it was all for free. This place has always been a top day trip for my family through the years. For young children, it is not only a day out in nature, but their children’s discovery are in the visitors building is full of interesting activities, books and things to see. For us as homeowners, it was a chance to see what particular trees and varieties look like, stroll through gardens that had great design ideas, enjoy beauty of the Japanese garden ( even if I had no intention of attempting to create one of my own). For the elderly, the drive thru tour saves energy and one’s legs while affording the wonder of the park setting and the beautiful grounds. If I had not seen the Northernmost planting of Bald Cypress I may not have known such plantings were possible. 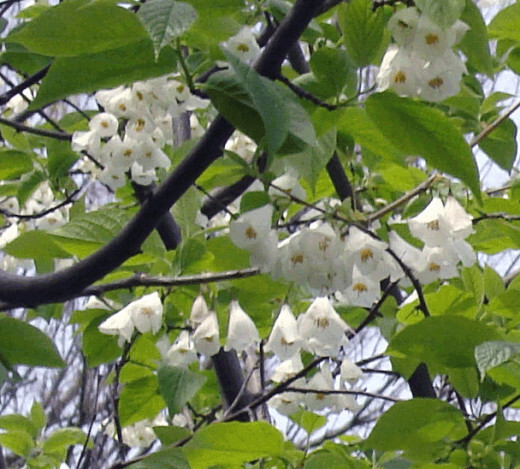 It inspired me to plant one in my own front yard, which has been a source of interest and beauty as a tree specimen. There are plantings I made, like the Chinese Chestnut trees, which did not benefit from such expert example. I tried them in my yard and promptly lost them to a particularly cold winter. I might have been saved the trouble if I had noticed they don’t grow them in the arboretum. As it was, I lost two valuable trees- time and money wasted through ignorance. That type of result is what a visit to these wonderful plant places can give you: an accurate idea of what will grow best in your climate and conditions. WHAT CAN BE FOUND AT DAWES? Some popular features are the Japanese Garden>, The Cypress Swamp, and The Azalea Glen. Bloodgood Japanese Maple – 4-5 ft. The effect of blooming crabapples is breathtaking. Many times such places are free. Some are free to members who pay annual fees; some are open to all, but require an entrance fee. Check in advance whether there is an entry fee or not. The costs are usually minimal in my experience. Such places give an education that benefits all of us collectively, and it is worthy of support. Donations or memberships are premier ways to support their work, and if there is an entrance fee it is usually minimal. All to a good cause. But most of us freely enjoy and learn! It is a very frugal way to get entertainment, and as a daytrip to explore when we travel. 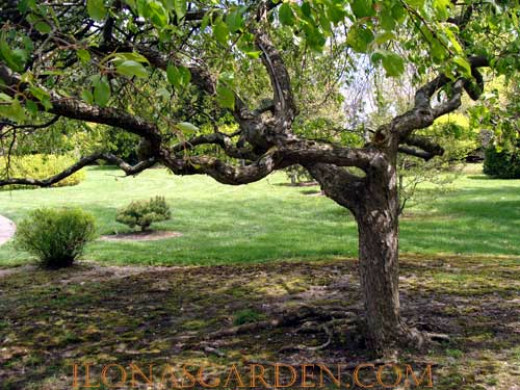 Arboretums are a great resource for the D-I-Y home landscaper. Nothing saves money like doing something yourself, and with plantings the important measure of success is not just looking good at the initial installation, but growing well over time. Seeing full grown plants in growing conditions like your own will be the best way to wisely choose, and perhaps see plants as they are tested for the home market. The brochures, the classes, and websites that are produced by these organizations will also provide invaluable information. Visiting these parks and gardened collections provide not just time in the outdoors, but a chance to pick up valuable materials, perhaps view library materials about trees and plants, and learn how to landscape localized to your own area. This can bring added success to the diy home landscaper. 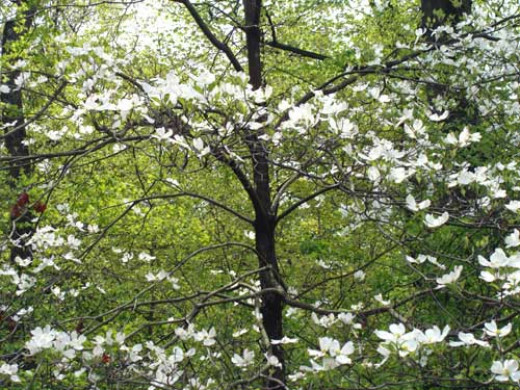 Description of Arboretum research and links to educational opportunities. California. Will This Save You Landscaping Money? Dawe’s is one of my favorite spots, especially in spring! My favorite is to see Magnolia Hill in bloom. And of course, the lookout tower. Such a special spot. I visited once in November, thinking it would be quite bare, and it wasn’t at all. There was autumn color to be found all around, from the beautyberry bushes to oak leaf hydrangea.